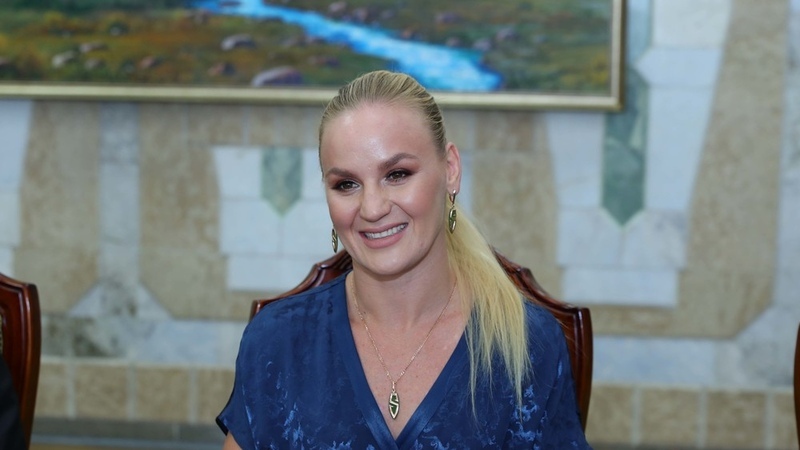 AKIPRESS.COM - UFC women's flyweight champion Valentina Shevchenko gave a press conference in Bishkek on April 8. She told about her plans while in Bishkek, career, marriage, and other things. - If you stayed in Kyrgyzstan, would you be able to achieve things you've achieved today? - I am happy and proud to be born in Kyrgyzstan. Kyrgyzstan gave me stamina and foundation. When I was here, I reached the point when I simply did not have rivals. Then my trainer Pavel Fedotov felt that we should move on. We went to Russia, and I faced the same problem there, too. Then we moved to Peru, where I got a good basis. - Your sister Antonina Shevchenko said that she loved walking around Osh bazaar when she was a little girl. Which places are you going to visit this time? - Osh bazaar is truly one of the must-see places in Bishkek. For me, it's a part of our culture. I have two associations with Kyrgyzstan: Issyk-Kul and Osh bazaar. For sure, I will visit the bazaar if I'll have time for that. - Will you work out while in Bishkek? - Of course. I'll have a fight in 2 months. I cannot take such a long break. - Do you plan to claim the UFC title in another weight category? - Yes, I do. I want to win a champion's title in another division. - Did you have negotiations about possible WEF fight? - My contract with UFC does not allow me to fight in any other organization. I have triple more responsibility as a champion. - Your toughest fight ever? - It's been a long time since I joined MMA. It's hard for me to highlight any fight separately. UFC fights are a huge responsibility. - Is Jessica Eye a worthy contender for title defense? - She is the number one contender who deserves the title defense match like no one else. - If you'd face your sister Antonina, who would win? - It won't happen. As Antonina said before, our mom does not approve that. - Do you have a boyfriend? What are your personal plans? - I don't understand why everyone is interested in it. Now my career comes first. To be number one in the world, you need to dedicate your entire self to it. It is possible to combine personal life and career, but it that case, you won't achieve greater results. - You've majored in film directing. Do you plan to shoot anything? - Fights take all of my time. Shooting requires a lot of time, so far, I am into the fights only. - What is the difference between working out in Peru and Kyrgyzstan? - No differences, if you're talking about my training. My trainer Pavel Fedotov was with me both in Kyrgyzstan and Peru. As for the other fighters, in Kyrgyzstan they are regarded as persons preparing for tournaments. In Peru, it's more of a fitness. - Are you planning to carry flags of Peru and Kyrgyzstan for the rest of your career? - I will continue performing on behalf of Peru and Kyrgyzstan. And Russia, I lived there for several years. Kyrgyzstan is my homeland, and I lived in Russia for several years. These countries are part of me. - When will you come back to Kyrgyzstan again? - Today I met with President Sooronbai Jeenbekov, he invited me to come to Kyrgyzstan at any time. Summer is when I will be able to come back here.